Workplace, industrial, transportation, and commercial safety is a big deal these days. The wheels of international commerce are greased with safety standards that enable efficiency, reliability, and sound commercial relations. Properly marking equipment, chemicals and hazardous materials is a subject closely regulated by the U.S. Occupational Safety and Health Administration (OSHA), conventions like the Globally Harmonized System of Classification and Labeling of Chemicals (GHS), and other regulatory agencies across the globe–not to mention being the subject of intense scrutiny by the lawyer class. Companies must be sure they’re in compliance with applicable notice requirements to ensure workplace safety, reduce liability, and minimize regulatory problems. When you mark a piece of equipment it’s your responsibility to ensure that the notice provided is accurate and effective–and a big part of this is the tag’s durability, resilience, and tamper resistance. 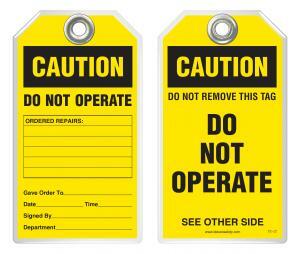 Self-Laminated Safety Tags offer protection, convenience, and easy customization. With the right laminating machine you can thermally laminate paper tags–like Idesco’s Laminated Q-Tags®–with heavy-duty polyester. Even simpler, Idesco’s laminated P-Tags® are durable plastic tags with polyester over-lamination that require you to simply peel off the liner and press down for a permanent personalized tag. Easy Safety Tag Customization – Most important is that these operational safety tags are highly and readily customizable by your technicians as they are applied onsite. 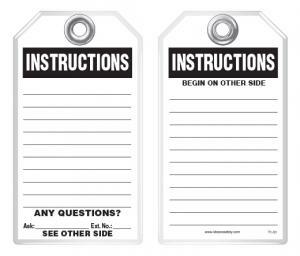 Technicians can write special instructions, hazards or warnings on the safety tags, including name, department, and employee-specific photos, bar codes, machine-specific data, special messages, right-to-know information, etc. Large tags increase visibility for critical information, and some tags have space to write identification, and hazard statements and additional comments on the back. For chemicals in the workplace, appropriate signal words and GHS pictogram labels are easily added to identify hazards. 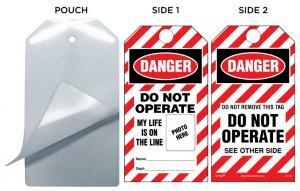 Then by simply sealing the message with the clear adhesive overlay, the safety label/message/warning is permanently protected in an OSHA-compliant safety tag–that won’t wear out, that doesn’t smudge, and that you can trust! Rugged durability that can withstand the toughest industrial environments. Ensuring tags are abuse- and tamper-proof. Resisting water, grease, extreme temperatures, and common industrial chemicals. Tagging your chemicals with appropriate Globally Harmonized System signal words and pictograms. Helping you comply with GHS principles adopted as part of OSHA's HazCom regulations. 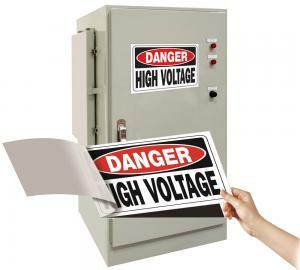 Reliably and clearly informing your teams of hazards ... and enabling workers and others to avoid accidentally or intentionally accessing, using, or powering up dangerous electrical or mechanical devices. Commerce and industry crisscross the world at a very fast-pace these days and no business can afford to make mistakes when it comes to personnel and worksite safety or regulatory compliance. 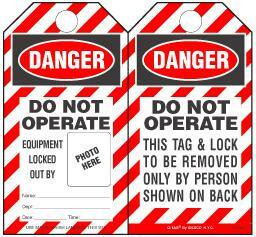 Self-laminated safety tags are genuine and simple solutions that serve both objectives well. 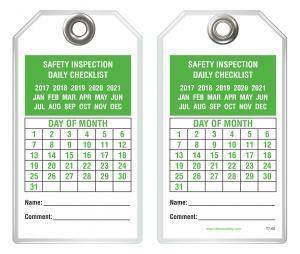 We invite you to review the numerous articles about self-laminated safety tags appearing in our Blog and elsewhere on this website, which we offer novices and experts alike to inform their decision-making processes.